The orchid is one of the most diverse plant species in the world. They are beautiful, complex, delicate, and exotic, containing over 30,000 species and approximately 200,000 different hybrids. Depending on the species, orchids can be found anywhere on the planet, from the arctic tundra to the tropics. It is easy to find orchids that are well-suited to whatever growing conditions you have for them, thanks to the vast variety and the plant’s ability to adapt to its environment. 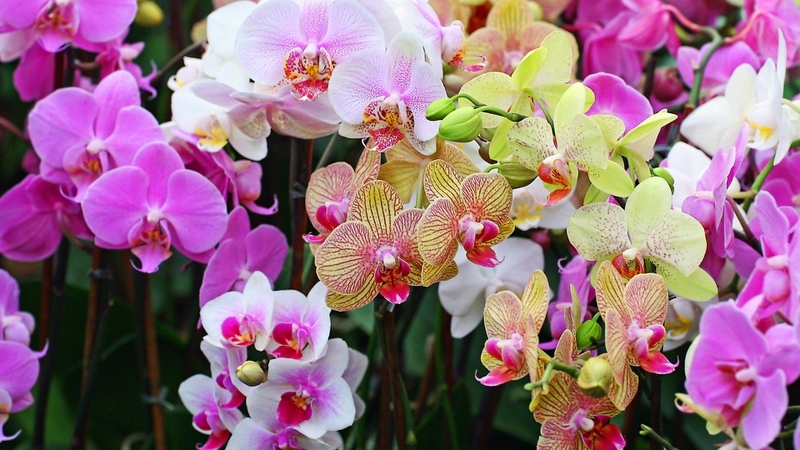 While many types of orchids can be very difficult to grow and keep alive, even for professionals, there are still many varieties and hybrids that you can choose from that would be a nice addition to your home or garden. Here you'll learn all about orchid care. Orchids only need to be watered once a week to once every ten days. To thoroughly water the orchid, take your orchids to the sink and let the water flood the pot. The water will run out through the mix. Leave it sit for a few minutes, then go back and flood the pot again. Leave it for a few more minutes then return it to its original spot. Don’t water too frequently. Be sure to regulate the temperature for your orchids, as most need an average temperature of between 55 and 80 degrees Fahrenheit. Boost the temperature for a while everyday if your home is kept at a constant 60 to 65 degrees, as this increase in warmth will help them thrive. Orchids need a lot of light, typically 12 to 14 hours a day, all year round. Be sure to move your plants around so that they receive optimal sun exposure throughout the day. Tips for winter orchid care: Use artificial light lamps to supplement during the shorter days of winter. Reduce the watering to once a month but mist the plant to keep up the humidity. Don’t fertilize in the winter. Most orchid varieties are grown in the tropics so they need high humidity, usually between 60 and 80%. While humidity during the winter can hover around 30%, you should use a humidifier. You can also keep your orchids grouped together on a dry well. To make a dry well, place pebbles or plastic lattice into a tray then add water to just below the top of the pebbles or lattice. Put your orchids on top of the lattice or pebbles, making sure to check the water level periodically. There are many fertilizers made specifically for orchids, including pellets and liquids. Liquids are typically added to your orchids once a month. Pellets can be sprinkled around your plants as is necessary, but never on dry soil. You can also add a blossom booster containing phosphorous to promote flowering such as Campbell Orchid Special Fertilizer A.
Orchard care is not complete without proper growing material. Some orchids grow in soil, like most plants, but most tropical varieties grow in the air. Their roots are covered in a layer of spongy cells that absorb water. They also protect the roots from too much moisture loss and heat. Most orchids grown in the home can be grown in coconut fiber, a variety of mosses, fir bark, or cork pieces, all of which provide proper drainage for your orchids. Orchids prefer a small pot and plastic is the best kind to use because it allows the roots to release easier for re-potting. You should fill the bottom of the pot with Styrofoam peanuts and then while holding the orchid above the pot, fill with the growing materials you have chosen. You should not re-pot your orchids until it is necessary. You’ll know it’s time if the roots are growing out of the pot or if the material has broken down, preventing aeration and proper water drainage. Peak blooming for orchids usually occurs in late winter and the blooms will last anywhere from four to twelve weeks, depending on the variety. When the bloom loses its color, cut it off about a half inch above where the shoot emerges from the foliage. If there is any fungus, cut at least a half inch below the infected spots. Remove any additional dead parts of the plant. Use sterile tools when cutting the plant and avoid cutting through a leaf as you can kill part of the plant. After the blooms have faded you have three options for pruning the flower spike. You can leave it alone, remove it all, or just cut it back to a node. Leaving the spike intact or just cutting back to a node can lead to the plant re-blooming from the tip of the spike. If there is discoloration in the spike it is best to remove it all. This directs energy to the roots, promoting new plant growth and a healthier orchid. Be sure to check the labels on the orchids you wish to have. This will help you to re-create the proper conditions for that orchid when you get it home. Make sure to choose an orchid that will fit with the growing environment you provide so that it will thrive. If you buy orchids that are already producing flowers you won’t have to wait years for your plants to bloom. Make sure you have the proper fertilizer for your plants and you use them correctly. Water-soluble fertilizers are the easiest and most convenient to use. Lower the fertilizer application and watering when the plant stops flowering. Do not over water your plants or leave water sitting on leaves. Follow proper watering procedures and your plant will thrive. Don’t worry if you see some discoloration. Move your plant to another area and keep adjusting the growing environment to keep your plants healthy. Server responsed at: 04/25/2019 8:51 a.m.